Light: Having it all. Knowing and loving yourself as completely as possible. Seeing the interconnection of all things and people. Enhancing your perspective. Living life to its fullest. Understanding the meaning of life. Shadow: Allowing greed and envy to prevent you from enjoying what you do possess. Failing to see the larger design in ordinary events. Believing that everything that exists can be touched, counted, or measured. Failing to see the divine reflected in those around you. Mythical/Spiritual: The ascended Christ. The Buddha attaining enlightenment. The alpha and the omega. The completion of the alchemist’s great work. Story: The main character lives happily ever after. Relationships. With mutual trust and effort, very different people can come together to create a reality greater than the sum of its parts. Once you have a taste of what can be, settling for less will be difficult. Keep in mind, though, that a dream of perfection can foster dissatisfaction with an otherwise perfectly good relationship. Work. Synergy! It’s possible for everyone involved to work together in harmony to create something better than any one person could produce on his or her own. Encourage people to share ideas. Allow others to share in the investment—and the glory. Unite and meet your goals. Spirituality. Enlightenment is a goal; reaching it is bliss. Rather than beat yourself up for falling short, celebrate your progress. 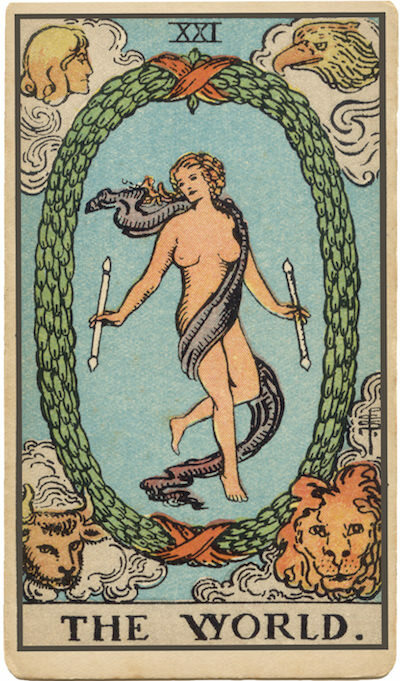 Meantime, keep in mind the lesson of the Tarot: Even as we reach one level of enlightenment, we become a fool again. Personal Growth. For most challenges, both intuitive and logical approaches exist. Most of us favor one over the other, but the secret to true mastery involves learning to wield both with perfect facility. Identify your least favorite approach, and then speed your growth by giving it special attention. Fortune Telling. Winning the lottery. Getting your heart’s desire. Having everything you ever imagined having. The mandolora. Both the Marseilles and RWS-inspired decks surround the central figure with a wreath, or mandalora. Like the oroborous, the snake that swallows its own tail, the mandalora has no beginning or end. Its shape also suggests the number zero—the designation of the Fool. If you examine the current situation in light of past events, what next step makes the most sense? The four evangelists. Previously seen in the corners of the Wheel, the signs of the four evangelists once again evoke the ultimate integration of all things. What do you need to bring together? How can you promote the stability of your solution? The central figure. The Wheel has been replaced by the victorious central figure, indicating that luck and fate have given way to the greater force of self-realization. In the Visconti deck, the central figure is a white city: the New Jerusalem. In some decks, it is the Christ. In others, it appears to be a hermaphrodite—the ultimate reunion of male and female energies in a single body. In your own situation, what would be the best ultimate outcome? The baton. In many decks, the central figure holds a baton; in RWS-influenced decks, he or she holds two. This is no longer the singular wand of the Magician! What might happen if you put both your magical and practical powers to work today? For me, what would having it all mean? How aware am I of my own connectedness to the world around me? What keeps me from having it all right now, today?